This topic contains 61 replies, has 6 voices, and was last updated by Sandra Strait 1 week, 1 day ago. This Forum area is for all things about FLORAL Technique Tutorials. This can include Gardens, Flower Bouquets, Macro Florals, etc. Check out this gorgeous Rose tutorial by Anna Mason! She’s another of my favourite Watercolour artists. This Tulips painting process by Andrew Geeson is very loose and something a beginner might manage quite well, I think. Lindsay Weirich’s enthusiasm for watercolour is contagious! Between Charlie’s Doodlewash and her YT channel, I know we will find our way with WC too! James Gurney has some tips about Floral Garden Painting. It’s a brilliant series chock full of information that is perfect for beginners and even intermediate painters! Wonder Forest shows us Mistletoe WC Cards for those who are already painting theirs! 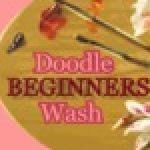 Flower petal tutorial posted above by Maria Raczynska. Angela Fehr shares a Stained Glass Poppies in Window effect in Watercolour. I so loved this, of course! 😃 I’ve a historical book on Tiffany that sparked my interest in this style! Have any of you ever done a piece in watercolour like this? This reply was modified 1 year, 4 months ago by Yvonne Reeder. You did ask Yvonne! This was from a Wendy Sinclair photograph. Very soothing to do – reminded me of painting paper doilies as a kid.